On the 9th of september 2006 the International Schapendoes Federation (ISF) was founded by the Schapendoes Clubs of Denmark, Finland, France, Germany, Luxembourg, the Netherlands, Norway, Sweden and Switserland. Goal of the ISF is to facilitate an optimal cooperation between the Schapendoes Clubs in order to preserve the health, breed type and good character of our Schapendoes all over the world. For decades the comprehension has established itself that mankind is faced with problems that cannot be adequately addressed at a national level. Now dog breed may not quite measure up in its importance to problems like global warming, migration, famine, but it is indubitable for all that reasonable concepts can only be expected beyond national boundaries. Not only in dog breeding internationality is confronted – even today – with suspicion and resistance. This may be understandable. With the assignment of rights but, of course, also of duties to an apparently superordinate institution one‘s own sovereignty seems reduced. However, neither in politics nor in dog breeding there are any alternatives. It is not possible to establish a solid foundation within the narrow limits of a club or country that promises to make responsible goals achievable. Internationalism is essential if one intends to provide a base for the good of the breed. For years by now, with the International Schapendoes Foundation an institution is being built up for which other breeds envy us a lot. Wise people have become aware years ago that an almost insular situation with corresponding restrictions and limitations cannot be hoped to result in positive consequences in dog breeding. Internal problems contributed additionally to this fact. So it was almost natural that the desire arose to break out of the national limitation. The establishment of the ESS served as a basis for initial discussions and for a rather informal exchange. Soon it was realized that a proper structure in its own right would be desirable for a regular exchange. The development of a genetic test to combat PRA jointly by the IGS and the VNS constituted the ultimate proof that cooperative action can be successful. 2006, the ISF was founded and since then we meet on the eve of the VNS club show to exchange information from the individual countries and clubs openly and trustfully. After the usual childhood diseases, the ISF developed into an organization that just because of its supranational disconnectedness has great potential. No doubt it will be up to the commitment of all whether this potential be used in the most effective way or whether it shall lie fallow. I would first like to mention some of the hopeful approaches of the ISF, which should be built up constructively. At the end, I allow myself to take a look at the future tasks and options of the ISF. Responsible breeding is based on reliable data. Without it, the selection – and breeding, unlike mere reproduction is always selective! – of suitable partner for mating can only be made severely limited. It is therefore most understandably that information about the health status collected by the VNS since the beginning were much sought-after. After a very changeful procedure, that I may skip here, it was possible a few years ago to bring about a change in consciousness that these very important data should be at disposal beyond any borders for other clubs as well. 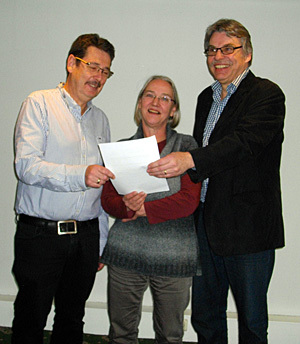 Thanks to the then President of the VNS Jettie Alberts after many failed attempts in the spring of 2012 a breakthrough was achieved: The Dutch data would be included in a database. National scruples were overcome – international cooperation had a first, not to be underestimated success! Founded by the VNS and IGS, as well as the DKK and SKK – the Norwegian Club NSK has since followed and others expressed their interest – , now five clubs conduct this continuously growing project “DoesData”, in which all health-related data of these countries are collected as well as inventories and show results. The respective breeding committees can fall back on it at any time and advised their breeders accordingly. Undoubtedly, further improvement of the data situation with view on the reliability of conclusions obtained on the basis of this databank would be highly desirable. Therefore I would want to emphasize at this point that other clubs are most welcome to join the project. I have no doubt that for them as well the available data are highly informative and have inestimable value for their breeders. Many breeds even have several data programs at their disposal. However, an international data program of this kind is known to me for any race. In future it might develop not only into a central instrument, but as well to a paradigmatic example, what commitment beyond club and private interests is capable of. If this database and its maintenance is also at the absolute center of our endeavors, there was only last autumn a number of other issues on which made an international exchange absolutely necessary. It must suffice here to name just a few of them: HD/ED and the assessment of its importance in the various clubs, PRA, cataract, as well as other health matters (MPP, RD, etc.). I refrain from a detailed report, but would like to refer to the website of the ISF. Let me finally come to tasks and desiderata with regard to the program that need to be considered an the future of an international breeding federation. That might sound like dreams of the future today. But not even Europe as a political structure was created in one day. And Europe required visionaries who did not want to settle for tackling all the way in small nudge. But I would like to state at first what the ISF should not develop into: The ISF shall not become in institution equipped with decision-making powers, which remain reserved to the individual clubs. There would be no legal basis for this nor the necessary requirements. The ISF will not take anything from the clubs, but it shall add an option to their actions: On a platform including the entire breed – as opposed to national or even club-specific sections of information – a broader perspective shall be opened up. The plenum of the ISF provides the place for exchange – an exchange that can be fruitful only on the basis of trust and equivalent rights of members on an equal footing. Once again I call upon the up to now absent clubs and their chairmen sincerely, to overcome old mostly personal animosities and to join the ISF. In the long run there is no alternative for the breed! We are all glad and lucky to have been able to eliminate with PRA an inherited disorder that has severely restricted breeding options in the breed. No one will hope that a similar problem would virtually render international cooperation indispensable. Nevertheless, we should take precautions and be prepared. It does not appear very smart to me to wait for a problem to break out and only then to begin to contemplate what could be done. To start collecting data and samples when a problem is already on the table certainly is not very foresightful. For a long time already I plead for the establishment of a blood database. Years ago we started to collect samples at the University of Bern. The Swiss Club has already included the delivery of samples in its breeding regulations. My respect! As already practiced in the Netherlands and in Germany, it would be most easy to provide a relatively inexpensive way to take samples in the context of club shows or perhaps the ESS. But also in the collection of health-related data, I would wish for a more direct cooperation. Would it not be pragmatically useful if we could agree on a common health questionnaire with each other? We all have a common goal – and we have a common data program, in which the collected information will be incorporated. Overall, it would certainly be welcome if the clubs and their people in charge could help to coordinate matters. An improvement and intensification of communication is certainly very beneficial for all. I would hope that by means of an international screening we would come to evaluations such as the health status of the breed, and if there is a decisive problem, to which one should devote an international project. I would hope as well that mutual advice on questions of choosing suitable breeding partners could take place on a level as a matter of course. There should ideally be no relevant information that would not be at the disposal of the other breeding committees. I would hope that would enter a discussion with each other about aspects and principles of breeding permissions: The relevance of individual diseases such as cataract and distichiasis is estimated differently by different clubs. In addition, I would find an open debate about breeding concepts very exciting. Maybe we can succeed – preparedness and good will of all presupposed – to develop the ISF to a forum that provides the structure for the exchange of experience and information. Let me appeal to all those responsible in the clubs a third time: Let’s work together. Together we can make and achieve a lot. Depuis des décennies, l’humanité a pris conscience du fait qu’elle est confrontée à des problèmes qui ne sont plus gérables d’une façon adéquate sur une échelle nationale. Certes, l’élevage des chiens n’a pas la même importance que le réchauffement climatique, la migration ou les famines. Il n’y a néanmoins pas de doute : dans tous ces cas, des stratégies judicieuses doivent être poursuivies au-delà des limites nationales. L’internationalité est – même aujourd’hui – considérée avec méfiance et réticence, et pas seulement dans le domaine de l’élevage des chiens. Ceci peut se comprendre. En cédant des droits, mais également en octroyant des devoirs, à une institution supérieure, il semble que l’on réduise sa propre souveraineté. Cependant : il n’y pas d’alternative, ni dans la politique, ni dans l’élevage des chiens. Dans les limites étroites d’un club ou d’un pays, il est impossible de créer à moyen terme des bases qui constitueraient un objectif acceptable. Afin de pouvoir agir pour le mieux de la race, en mettant en place de bonnes bases, l’internationalité est indispensable. Depuis des années, l’ISF représente une institution en construction que d’autres clubs de race nous envient. Des personnes avisées se sont rendu compte depuis un moment déjà que dans l’élevage des chiens une limitation pour ainsi dire insulaire à des frontières nationales n’engendre pas les résultats souhaités. Les difficultés internes de certains clubs ont encore accentué le problème. Il a donc paru naturel de ne pas se restreindre aux limites nationales. La mise en place de l’ESS a servi tout d’abord de base pour un échange plutôt informel lors des premiers entretiens. Puis il sembla rapidement souhaitable de créer une structure adaptée à des échanges réguliers. Le développement d’un test génétique en commun par l’IGS et la VNS pour combattre l’APR fut la preuve de la réussite d’une action coopérative. L’ISF fût fondée en 2006 et depuis, ses membres se réunissent la veille de la nationale d’élevage de la VNS pour échanger en toute confiance des informations des différents pays et clubs de race. Après les “maladies infantiles” habituelles, l’ISF se développe sous la forme d’une association qui possède un potentiel important, justement en raison de sa supranationalité et de l’absence d’une structure rigide. L’engagement de tous fera que ce potentiel sera exploité au laissé à l’abandon. Dans ce qui suit, j’aimerais mentionner quelques approches prometteuses de l’ISF qu’il va falloir continuer à développer. En conclusion je me permettrai de jeter un regard sur les futures missions et options de l’ISF. Un élevage responsable est basé sur des données fiables, sans lesquelles il est très difficile de sélectionner – et l’élevage est toujours sélectif, contrairement à la reproduction irréfléchie – un partenaire adéquat pour un accouplement. Il est donc évident que les données sur l’état de santé de la race, rassemblées depuis le début par la VNS, étaient très convoitées. Une procédure assez mouvementée, que je me permets de négliger, a permis d’obtenir une prise de conscience de la nécessité de mettre toutes ces données signifiantes à la disposition de tous, au-delà des limites du club de race, pour le bien-être de la race. Après plusieurs essais qui ont échoué, un succès a pu être obtenu au printemps 2012, grâce à la présidente d’époque de la VNS, Jettie Alberts : les données néerlandaises seraient mises à la disposition dans une base de données. Les doutes nationaux ont pu être dissipés – et la collaboration internationale a connu une première réussite non négligeable ! “Does Data” a été fondé par la VNS et l’IGS, ainsi que par les clubs danois (DKK) et suisse (SSK). Le club norvégien (NSK) l’a entre-temps rejoint. 5 clubs de race portent donc désormais ce projet qui ne cesse de se développer et dans lequel sont rassemblées toutes les données relatives à la santé, tout comme les résultats des expositions et des “inventaires” des pays participants. Les commissions d’élevage des clubs respectifs y ont accès à tout moment et peuvent ainsi conseiller leurs éleveurs. Il serait sans doute souhaitable d’améliorer encore la base de données, afin de pouvoir fournir des renseignements encore plus fiables. C’est pour cette raison, que je souhaite souligner dès maintenant, que d’autres clubs sont les bienvenus pour rejoindre ce projet. Je ne doute pas que les données mises à disposition soient riches d’enseignements et qu’elles soient d’une valeur inestimable pour leurs éleveurs. Bon nombre de races disposent d’une multitude de bases de données. Mais à ma connaissance il n’existe pas d’autre base de données internationale de ce genre. Elle pourrait à l’avenir non seulement représenter un centre d’échange, mais également être un exemple paradigmatique pour ce qui est possible quand on s’engage ensemble en dépassant les limites des clubs et des intérêts privés. Même si cette base de données et son entretien étaient déjà au centre de nos activités, nous avions d’autres sujets, notamment l’automne dernier, qui méritaient d’être discutés au niveau international. Je n’en nommerai ici que quelques uns : la dysplasie de la hanche et du coude et l’évaluation de leur importance dans les différents clubs, l’APR, la cataracte, et d’autres questions de santé (MPP – membrana pupillaris persistens, dysplasie de la rétine, etc.). Je m’abstiens volontairement de faire un compte rendu plus détaillé, mais je me permets de vous renvoyer au site internet de l’ISF. En conclusion, permettez-moi d’en venir aux tâches et aux désidérata qui devraient dorénavant être pris en considération par une association d’élevage internationale. Cela relève encore de l’avenir, mais l’Europe non plus, en tant qu’institution politique, ne s’est créée en un seul jour. Et l’Europe également a eu besoin de visionnaires, qui ne se contentaient pas de petits progrès pour poursuivre ce long chemin. Mais tout d’abord j’aimerais souligner ce que l’ISF ne doit pas devenir : elle ne doit en aucune façon disposer des mêmes pouvoirs de décision que les différents clubs. Il n’y a pas de fondement juridique pour le justifier, ni de nécessité. L’ISF ne doit en rien enlever les compétences des clubs de race, mais plutôt leur ajouter une option : au-delà des limites d’un pays ou d’un club, elle veut proposer une perspective plus large, sur une échelle qui englobe la race toute entière. Le plénum de l’ISF offre un lieu d’échange – un échange qui ne peut être fertile que sur une base de confiance et de droits ex aequo des membres qui sont sur un pied d’égalité. J’invite encore une fois chaleureusement les clubs de race et leurs présidents, qui se sont abstenus jusqu’à présent, de passer outre aux animosités, souvent personnelles, et de venir rejoindre l’ISF. Il n’y pas pas d’autre alternative pour la race à long terme ! Nous sommes tous heureux d’avoir éliminé l’APR, une maladie génétique qui avait restreint fortement l’élevage. Afin d’éviter une problématique similaire, nous devrions nous préparer et nous armer. Commencer à réfléchir et à collecter des données uniquement quand le problème est déjà d’actualité, ne me semble pas très sage et prévoyant. C’est pour cette raison, que je plaide depuis longtemps pour la création d’une banque de sang. Il y a quelques années, nous avons commencé à collecter des prises de sang à l’université de Berne. Le club de race suisse a déjà inscrit la prise de sang dans son règlement d’élevage. Chapeau ! Comme cela est déjà pratiqué aux Pays-Bas et en Allemagne, il serait facile de mettre en place une possibilité de prise de sang à un prix avantageux lors des nationales d’élevage ou de l’ESS. Je souhaiterais également une collaboration plus directe pour la récolte des données. Ne serait-il pas judicieux et pragmatique de se mettre d’accord pour un questionnaire de santé commun ? Nous avons tous un même objectif – et une même gestion des données, dans laquelle les informations récoltées devront être entrées. Dans l’ensemble, il serait souhaitable que les clubs accordent un peu plus leurs violons. L’amélioration et l’intensification de la communication seront sans doute avantageuses pour tout le monde. Je souhaiterais qu’on arrive par un dépistage international à obtenir une représentation de l’état actuel de la santé de la race. Ainsi il est possible de tenir compte de problèmes éventuels pour lesquels on pourrait mettre en place un projet international. Je souhaiterais que les échanges mutuels concernant les questions relevant de la l’accouplement soient consolidés un peu plus, sur une base de confiance. Dans l’idéal, chaque commission d’élevage devrait disposer de toutes les informations nécessaires. Je souhaiterais que nous entrions dans une discussion commune, comme p.ex. sur des aspects de l’admission à la reproduction : l’importance des différentes maladies, par exemple le distichiasis et la cataracte, n’est pas évaluée de la même façon dans les différents clubs de race. En outre, je trouverais passionnant de parler ensemble des différentes conceptions de l’élevage. Peut-être sera-t-il possible – sous réserve de la disposition et de la bonne volonté de tous – de faire de l’ISF un forum qui servira de lieu et de cadre pour un échange d’expériences et d’informations. Permettez-moi une troisième fois de lancer un appel à tous les responsables : Coopérez. Ensemble nous pourrions réaliser tant de choses et aller plus loin. Seit Jahrzehnten hat sich die Einsicht durchgesetzt, dass die Menschheit mit Problemen konfrontiert ist, die auf nationaler Ebene nicht mehr angemessen bewältigt werden können. Nun mag Hundezucht in ihrer Bedeutung nicht ganz an Erderwärmung, Migration, Hungerkatastrophen heranreichen, dennoch ist unbezweifelbar, dass in allen Fällen vernünftige Konzepte nur jenseits nationaler Begrenzungen zu erwarten sind. Nicht nur in der Hundezucht begegnet man – auch heute noch – Internationalität mit Argwohn und Widerstand. Das mag verständlich sein. Mit der Abtretung von Rechten, aber auch Pflichten an eine übergeordnete Institution scheint die eigene Souveränität vermindert. Dennoch: Weder in der Politik noch in der Hundezucht gibt es dazu eine Alternative. In den engen Grenzen eines Clubs oder Landes lassen sich mittelfristig nicht Grundlagen schaffen, die ein verantwortbares Ziel erreichbar scheinen lassen. Internationalität ist unumgänglich, will man basislegend zum Besten der Rasse agieren. Seit Jahren ist mit der ISF eine Institution im Aufbau begriffen, um die uns andere Rassen beneiden. Klugen Menschen ist schon vor Jahren bewusst geworden, dass die geradezu insulare Beschränkung etwa auf nationale Grenzen in der Hundezucht nicht im erhofften Maße positive Folgen nach sich zieht. Die internen Probleme der jeweiligen Clubs trug ein übrigens zu dieser Tatsache bei. So war es geradezu natürlich, dass der Wunsch entstand, aus der nationalen Beschränkung auszubrechen. Die Etablierung der ESS diente zunächst als Basis für erste Gespräche und für einen eher informellen Austausch. Bald erkannte man, dass für einen regulären Austausch eine eigene Struktur wünschenswert wäre. Die Entwicklung eines Gentests zur Bekämpfung von PRA gemeinsam durch die IGS und die VNS war letztlich der Erweis, welche Erfolge kooperatives Handeln haben kann. 2006 wurde die ISF gegründet, die sich seitdem am Vorabend der VNS-Clubschau trifft und vertrauensvoll Informationen aus den einzelnen Ländern und Clubs austauscht. Nach den üblichen Kinderkrankheiten entwickelt sich die ISF zu einem Verband, der gerade aufgrund seiner übernationalen Unverbundenheit großes Potenzial besitzt. Zweifellos wird es an dem Engagement aller liegen, ob dieses Potenzial ausgeschöpft wird oder brach liegen bleibt. Ich möchte im Folgenden zunächst einige hoffnungsvolle Ansätze der ISF erwähnen, die es gilt, konstruktiv weiter auszubauen. Abschließend erlaube ich mir, einen Blick auf die zukünftigen Aufgaben und Optionen der ISF zu werfen. Eine verantwortliche Zucht basiert auf verlässlichen Daten. Ohne sie kann die Selektion – und Zucht ist, im Gegensatz zu Vermehrung, immer selektiv! – passender Partner für Verpaarungen nur höchst eingeschränkt vorgenommen werden. Es liegt demnach auf der Hand, dass die in der Vergangenheit von der VNS seit Anbeginn über den gesundheitlichen Zustand der Rasse gesammelten Daten heiß begehrt waren. Nach einem sehr wechselvollen Prozedere, das ich hier überspringen darf, gelang es vor einigen Jahren, eine Bewusstseinsänderung zu bewirken, dass diese überaus bedeutsamen Daten über Clubgrenzen hinaus zum Besten der Rasse zur Verfügung stehen müssten. Es ist der damaligen Präsidentin der VNS Jettie Alberts zu danken, dass nach vielen gescheiterten Versuchen im Frühjahr 2012 ein Durchbruch gelang: Die holländischen Daten würden in eine Datenbank einfließen. Nationale Bedenklichkeiten waren überwunden – die internationale Zusammenarbeit hatte einen ersten, nicht zu unterschätzenden Erfolg! Gegründet von der VNS und IGS, sowie dem dänischen und schweizer Club DKK und SKK, hat sich zwischenzeitlich auch der norwegische Club NSK angeschlossen, so dass nunmehr fünf Clubs dieses stetig weiter wachsende Projekt „DoesData“ tragen, in dem nunmehr alle gesundheitsrelevanten Daten dieser Länder – wie auch Inventarisierungs- und Ausstellungsergebnisse – gesammelt sind. Die jeweiligen Zuchtkommissionen können jederzeit darauf zurückgreifen und ihre Züchter dementsprechend beraten. Zweifellos wäre eine weitere Verbesserung der Datenlage im Sinne der Verlässlichkeit von zu gewinnenden Aussagen höchst wünschenswert. Aus diesem Grund möchte ich schon an dieser Stelle betonen, dass weitere Clubs herzlich willkommen sind, sich dem Projekt anzuschließen. Ich zweifle nicht daran, dass auch für sie die zur Verfügung stehenden Daten höchst aufschlussreich sind und für ihre Züchter unschätzbaren Wert hätten. Viele Rassen verfügen über eine Vielzahl von Datenprogrammen. Ein internationales Datenprogramm dieser Art ist mir allerdings für keine Rasse bekannt. Es könnte für die Zukunft nicht nur ein Zentrum, sondern auch ein paradigmatisches Beispiel abgeben, wozu Engagement jenseits von Club- und privaten Interessen fähig ist. Wenn diese Datenbank und ihre Pflege auch im absoluten Mittelpunkt unseres Tuns steht, gab es allein im vergangenen Herbst eine Reihe von weiteren Themen, über die es galt, sich international auszutauschen. Es muss an dieser Stelle genügen, einige davon hier nur zu nennen: HD/ED und die Einschätzung von deren Bedeutung in den einzelnen Clubs, PRA, Katarakt, wie auch andere gesundheitsfragen (MPP, RD, etc.). Ich verzichte bewusst auf einen detaillierten Bericht, verweise aber gern auf die website der ISF. Lassen Sie mich abschließend noch auf Aufgabenfelder und Desiderate zu sprechen kommen, die zukünftig von einem internationalen Zuchtverband bedacht werden müssten. Das mag heute noch wie Zukunftsmusik klingen. Doch auch Europa ist als politische Struktur nicht an einem Tag entstanden. Und auch Europa hat Visionäre gebraucht, die sich nicht damit begnügen wollten, den weiten Weg in kleinen Schrittchen anzugehen. Doch möchte ich zunächst konstatieren, was die ISF nicht werden soll: Sie soll keineswegs mit Entscheidungsbefugnissen ausgestattet sein, wie sie den einzelnen Clubs zukommen. Dazu gibt es weder rechtliche Grundlagen noch den notwendigen Bedarf. Die ISF soll den Clubs nichts an Befugnissen wegnehmen, sondern deren Tun eine Option hinzufügen: Auf einer die gesamte Rasse umfassenden Ebene – anstelle nationaler oder gar clubspezifischer Ausschnitte – soll eine breitere Perspektive eröffnet werden. Das Plenum der ISF bietet den Ort für Austausch – einem Austausch, der nur auf der Basis von Vertrauen und gleichrangigen Rechten der Mitglieder auf Augenhöhe fruchtbar werden kann. Noch einmal rufe ich die bislang abstinenten Clubs und deren Vorsitzende herzlich auf, sich über altangestammte, meist persönlich motivierte Animositäten hinwegzusetzen und sich der ISF anzuschließen. Langfristig gibt es für die Rasse keine Alternative! Wir alle sind froh und glücklich, mit PRA eine erbliche Erkrankung, die das Zuchtgeschehen in der Rasse massiv eingeschränkt hat, eliminiert zu haben. Und niemand wird hoffen, dass eine ähnliche Problematik quasi von sich aus internationale Zusammenarbeit unabdingbar macht. Dennoch sollten wir vorbauen und gewappnet sein. Erst dann mit Überlegungen und dem Sammeln von Daten zu beginnen, wenn ein Problem schon auf dem Tisch liegt, erscheint mir nicht sehr klug und vorausschauend. Seit langem plädiere ich deshalb für den Aufbau einer Blutdatenbank. Vor Jahren haben wir begonnen, Proben an der Universität Bern zu sammeln. Der schweizer Club hat die Abgabe von Proben bereits in seine Zuchtordnung aufgenommen. Mein Respekt! Wie schon in Holland und in Deutschland praktiziert, wäre es ein leichtes, dafür im Kontext von Clubschauen – oder womöglich der ESS – eine relativ preisgünstige Möglichkeit zu schaffen. Doch auch in der Erhebung von gesundheitsrelevanten Daten würde ich mir eine direktere Kooperation wünschen. Wäre es nicht pragmatisch sinnvoll, wenn man sich miteinander auf einen gemeinsamen Gesundheitsfragebogen einigen könnte? Wir haben alle ein gemeinsames Ziel – und wir haben eine gemeinsame Datenverwaltung, in die die erhobenen Informationen einfließen sollen. Insgesamt wäre es zweifellos begrüßenswert, wenn man sich unter den Clubs stärker abstimmen würde. Eine Verbesserung und Intensivierung der Kommunikation ist gewiss sehr vorteilhaft für alle. Ich würde mir wünschen, dass wir durch ein internationales Screening zu Aussagen kommen, wie der gesundheitliche Stand der Rasse ist und ob es gegebenenfalls ein Problem gibt, dem man ein internationales Projekt widmen sollte. Ich würde mir wünschen, dass die gegenseitige Beratung bezüglich Verpaarungsfragen sich weiterhin vertrauensvoll ausbauen lässt. Es dürfte idealiter keine relevante Information geben, die der jeweiligen Zuchtkommission nicht zur Verfügung stünde. Ich würde mir wünschen, dass wir in eine Diskussion miteinander einsteigen etwa über Aspekte der Zuchtzulassung: Die Bedeutung einzelner Erkrankungen wie zum Beispiel Distichiasis und Katarakt wird von den verschiedenen Clubs unterschiedlich eingeschätzt. Darüber hinaus fände ich eine gemeinsame Debatte über diverse Zuchtkonzepte sehr spannend. Vielleicht kann es – die Bereitschaft und den guten Willen aller vorausgesetzt – gelingen, die ISF zu einem Forum zu entwickeln, das dem Erfahrungs- und Informationsaustausch Ort und Rahmen gibt. Lassen Sie mich ein drittes Mal den Appell an alles Verantwortlichen anbringen: Arbeiten Sie mit. Gemeinsam können wir viel gestalten und erreichen. Das Ganze ist mehr als die Summe der Einzelteile. After a meeting of the VNS and IGS in Molenhoek on Good Friday I may inform all Schapendoesfriends at home and abroad that we now have a professional data program that shall prove to be future oriented for the breeding of our Schapendoes. Finally we succeeded in founding an international cooperation which can look back on more than 60 years of experience in breeding Schapendoes. Beside the VNS and the IGS, the Swiss and the Danish club join in! We very much hope that other clubs follow our invitation to cooperate. This mutual databank offers the chance to get a reliable and exceedingly essential, dense and furthermore growing information basis of data relevant for breeding which shall allow to breed our Schapendoes tomorrow with the highest degree of security thinkable. Shortly I shall be able to report in more detail about the future procedure. But already today I rejoice to be able to announce this fact. I certainly do not want to close these few lines without explicit thanks to all who contributed to the success of this mutual enterprise but before all I thank our friends of the VNS and the IGS of the Swiss and the Danish club. Many thanks to all & best regards.